So you’ve decided to declutter your home. That’s great! To help you keep things organized as you decide what to send where, you’ve rented a portable storage container. That’s even better! But how can you keep this space from becoming just as cluttered as your home, attic, or garage? The moving and storage pros at Smooth Move have some tips for getting the most out of your mobile storage container. It’s tempting to throw a bunch of stuff into a portable storage container just to get it out of your house. But that’s just creating more clutter in a different place. Try to think carefully about each item you put in storage. If you already know it needs to be trashed or donated, go ahead and make those moves. Taking action now means you’ll have less to sort through later on. As you’re making piles of things to go in your storage container, take a little extra time to organize them. Buy plastic totes, put similar items together, and label them. For example, if you have baby clothes that you plan to sell or give to someone later, put them all in a tote or two. When the time comes to get rid of them for good, they’ll be much easier to locate. There’s nothing worse than hurrying through any type of cleaning or organizational task. In many cases, you wind up with even more work to do down the road. When you work with moving container companies like ours, you’ll get as much time as you need to go through everything. Work at your pace without any stress. It’s one of the easiest ways to handle your decluttering project! 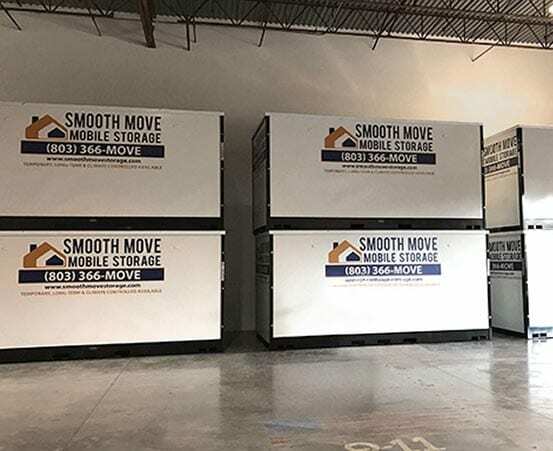 To learn more or to get a quote on mobile storage, call Smooth Move today.